The solution is simple & elegant. Both the wheels are a bit flanged OR conicle. The part having greater diameter of the frustum of the conical wheels is inward while of lesser diameter are outwards the track. Now whenever a trains travel on a curved track, the wheels get slide away in either of the direction. Wheels of a train while taking a turn ! Suppose the train is taking a left turn(as in the above picture). Which means the wheels will slide to the right(→) side, obviously due to centrifugal force. 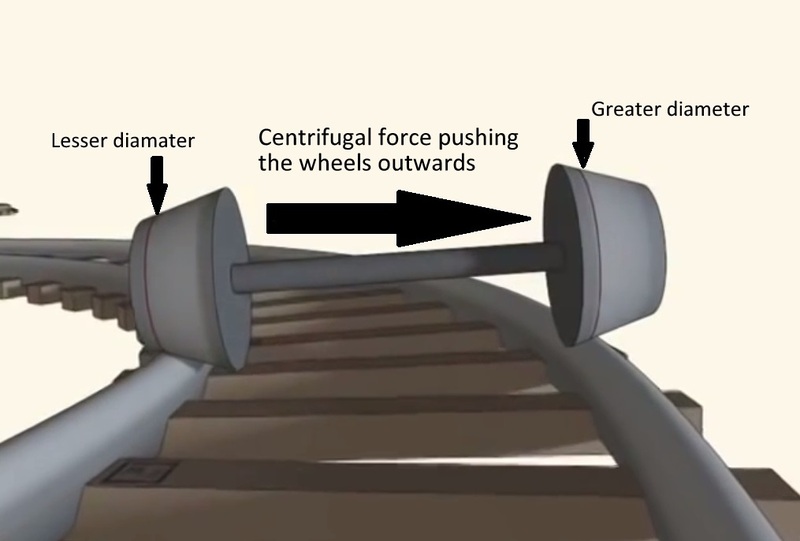 The outward force-centrifugal force results in increment of diameter of right wheel(↑) & decrement of left wheel(↓) during the turn(the black line on wheels in the above image). Also it solves one more major problem. Whenever there is a bump on tracks, the wheels suddenly slide even when travelling on a straight track & there is a great danger of being derailed, so the same design helps to stabilize the train & to run smoother. Here is a video which will help you to understand it better. The most simple designs are considered as the best solutions ! So besides the working, what we also learn is that – It isn’t necessary every time to make complex machines & design complex mechanisms, all it takes is a simple design of the thing what we already have.